The week's big Mac news is the new MacBook Pro line, which uses the 'Santa Rosa' chipset and runs on an 800 MHz bus. Graphics are also improved with the move to an Nvidia GPU - Bare Feats has benchmark results. Lots of hard drive news: Hitachi has a rugged 250 GB notebook drive, and Fujitsu has the first 2.5" drives to spin at 15,000 rpm! On the solid state front, SanDisk has a 64 GB flash drive. Searching for wireless? Three software programs covered today can help you find and connect to free WiFi networks. "With Intel Core 2 Duo performance, more memory and state-of-the-art graphics, this MacBook Pro is a portable powerhouse for creative and professional users," said Philip Schiller, Apple's senior vice president of Worldwide Product Marketing. "Apple's notebooks have always led the industry in innovation with features like built-in 802.11 and the MagSafe Power Adapter, and now the industry's first 15" LED-backlit display is another step toward completely eliminating mercury from our displays." The MacBook Pro's lightweight, aluminum enclosure is just one-inch thin and is available in three models: 2.2 GHz and 2.4 GHz 15" MacBook Pro models, and a 2.4 GHz 17" MacBook Pro model. The new 15" MacBook Pro models feature a brand-new, power-efficient LED-backlit display and are the first of Apple's notebooks to transition to LED backlighting as part of the company's effort to eliminate the use of mercury in its products. The 17" model now offers a new optional 1920 x 1200 high-resolution display, providing over 30 percent more screen real estate than the standard 1680 x 1050 display. Designed for mobile professionals, the MacBook Pro includes a built-in iSight video camera for video conferencing on-the-go, Apple's MagSafe Power Adapter that magnetically connects the power cord to the MacBook Pro and safely disconnects when under strain, and the latest generation of 802.11n wireless networking for up to five times the performance and twice the range of 802.11g. Every new MacBook Pro also includes built-in 10/100/1000 Base-T Gigabit Ethernet for high-speed networking, Bluetooth 2.0+EDR (Enhanced Data Rate), a FireWire 800 and a FireWire 400 port, a backlit illuminated keyboard, an ExpressCard/34 expansion card slot for expansion solutions such as 3G wireless networking, and a DVI video output to connect up to a 30-inch Apple Cinema HD Display. The MacBook Pro comes with iLife '06, the next generation of Apple's award-winning suite of digital lifestyle applications featuring iPhoto, iMovie HD, iDVD, GarageBand and iWeb. The MacBook Pro also comes with the latest release of the world's most advanced operating system, Mac OS X version 10.4.9 Tiger, including Safari, Mail, iCal, iChat AV, Front Row and Photo Booth. The new MacBook Pro models are now shipping and will be available through the Apple Store, Apple's retail stores, and Apple Authorized Resellers. Additional build-to-order options for the MacBook Pro include the ability to upgrade to a 160 GB (5400 rpm), 160 GB (7200 rpm), 200 GB (4200 rpm) or a 250 GB (4200 rpm) hard drive, up to 4 GB DDR2 SDRAM, Apple MagSafe Airline Adapter, Apple USB Modem, glossy widescreen display, 17" 1920 x 1200 high-resolution display and the AppleCare Protection Plan. Additional build-to-order options also include preinstalled copies of iWork '06, Logic Express 7, Final Cut Express HD 3.5 and Aperture 1.5. **Based on estimated results comparing a preproduction 2.4 GHz Core 2 Duo MacBook Pro with a 2.16 GHz Core Duo MacBook Pro. "The NEW 13" MacBook 2.16 GHz Core 2 Duo ran Quake 4 and Doom 3 so slow, we didn't bother to test it with the other 3D games. It is unsatisfactory for 3D Gaming. "Why? The integrated GMA 950 graphics chip may work great for QuickTime or DVD playback, but it is "un-optimized" for 3D Gaming...."
"In summary, Apple used only the most important features available in the Santa Rosa platform (chipset and CPU). By not integrating Turbo Memory, the new MacBook Pro models can not be certified Santa Rosa Centrino Duo...."
Turbo memory that supplements the standard hard drive with NAND flash for faster booting. Automated security and IT management features that will allow corporate system administrators to repair and protect employees' notebooks remotely, inspecting faulty PCs or adding software patches over wireless links. "While the improved battery life is something to get excited about, sadly it doesn't appear that Apple is taking advantage of two of the most significant benefits of the new chip: Turbo memory and Automated security." "Apple's elves gave me more details about the Santa Rosa MacBook Pro. Here's some stuff you don't know about the revision. How much battery life does the LED Backlighting save? Is there a full brightness warmup? What is the comparison in brightness, color range? Why no 17" with LEDs? Glossy and Matte finish in all screen sizes and variants? Does the 1920 by 1200 resolution mean Blu-ray is coming? Resolution has always been great at 115 pixels per inch, until Tiger Leopard's UI scaling comes out, will the fonts be too small? Hard drive configs: Which are perpendicular and what are the max sizes? "The 8600M GT is a formidable video card which appears to be on par with the ATI Mobility Radeon x1900 according to early benchmarks." 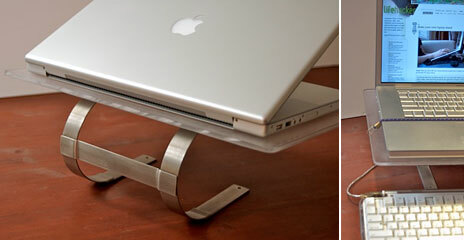 "This [laptop stand] was made from some plexi and an Ikea paper towel holder that I had laying around. I drilled some holes in the stainless steel crosspiece (don't try this without a drill press and graduated high speed bits). I counterbored 4 screws into the plexi and bolted it together. It works and looks good. There is some bounce due to the springiness of the thin steel. This setup allows me to use a keyboard, tablet and maintain proper ergonomics. I also strap a miniature bungee cord just below the keyboard, mostly for peace of mind." PR: How can owners of defective 17" G4 1.67 GHz PowerBooks and help Apple to instigate a Display Repair Extension Program? A campaigning Wiki has been launched for the hundreds (thousands?) of owners of defective Apple 17" G4 1.67 GHz PowerBooks afflicted by the "Bridget Riley" vertical lines display defect. Already paid for your own repair? A Display Repair Extension Program will reimburse the repair cost - so please do join in the campaign. Incontrovertible evidence at a defect database website seems to indicate by correlation that the defective batch of computers was manufactured at Shanghai factory (W8) around Mar-Apr 05. So why are official Apple Discussions forum administrators using censorship and censuring to suppress public discussions of this problem? Why has Apple so far ignored this manufacturing defect by failing to even announce an investigation of this problem, pending the kind of Display Repair Extension Program that they have in place for already for the 15 inch G4 PowerBook's "white spots" defect? How can owners of afflicted PowerBooks take action to persuade Apple to instigate a Display Repair Extension Program? Look out for green ACTION boxes containing suggestions of actions you can take, and for yellow QUESTION boxes to which you may be able to supply answers for the benefit of other owners of afflicted PowerBooks by editing this Wiki. Censorship note: Some of this Wiki's content was initially posted to the official Apple Discussions forum Apple.com > Support > Discussions > PowerBook G4 17-inch > The PowerBook G4 17inch Display, only for the administrators to promptly delete it, as they have done with messages and entire threads from scores of other folks with defective PowerBooks - see Apple's Censorship & Censure for more info. "Remember when Apple ditched the clamshell iBooks and created the sleeker 'icebook' form factor? My wife calls them Chicklets. Well we have 3 of them: a 500 MHz G3 from 2001 with a 10 GB drive, a 800 MHz G4 with a 60 GB drive but a busted optical drive, and a 1.2 GHz G4 with a 30 GB drive but working CD-R/DVD drive. The 800 MHz machine is still my old personal machine, although between hacks and apps and data overload it is very slow. The other two have found new life." "Intel formally launched its '3-series' chipsets on Tuesday here at Computex, adding a few surprises along the way: the addition of two new chipsets, formally scheduled for the third quarter, and a Core 2 Extreme processor that's slated for notebooks. "Intel's 'Bearlake' chipsets, now known as the '3' series, come in two flavors: the G33 and P35 series that have been shipping since April, as well as the Q33 and Q35, two chipsets that were formally due in the third quarter. Intel also announced the G35 and X38 enthusiast chipsets, which are supposed to ship within ninety days. Both of the latter chipsets, however, have made appearances here at the Computex show." "With a few minor upgrades to processing speed, memory allotment, hard-drive size, and wireless bandwidth, the Apple MacBook remains a well-designed, fully featured, thin-and-light laptop." "Since its debut in May 2006, the MacBook family has earned a place in the pantheon of Apple's all-time greatest hits. The sturdy, Intel-powered notebooks have been so popular with consumers, especially students, that they've helped the company nearly double its laptop sales over the last year and grab close to 10 percent of the U.S. retail market. "The biggest winner in all this is probably the entry-level model. In the previous generation, with only 2 MB of L2 cache and 512 MB of RAM in the standard configuration, it felt a bit sluggish, at least to me, in comparison to the other two models. Now, that's no longer true. In terms of Macworld Lab's Speedmark 4.5 benchmark, the new $1,099 model's score of 192 is a jump of 13.6 percent compared with the discontinued 1.83 GHz model." PR: Hitachi Global Storage Technologies (Hitachi) is announcing volume shipment of the industry's highest-performing and lowest power-consuming laptop hard disk drive at a quarter terabyte of capacity. The Travelstar™ 5K250 hard drive combines the fastest application performance in PCMark testing with the best power-efficiency of any 250 gigabyte1 (GB) 5400 RPM drive in its class. The newest 5400 RPM 2.5" hard drive from Hitachi - developed for notebook PCs, external storage devices, gaming consoles and other mobile devices - also features a host of category-leading features including 400G shock protection, quiet acoustics and optional Bulk Data Encryption for hard-drive level data security. The Travelstar 5K250 hard drive offers 56 percent more capacity, a 23 percent shock improvement and an 8 percent overall application performance boost over its predecessor, the Travelstar 5K160 hard drive. According to the PCMark05 Benchmark, the Travelstar 5K250 hard drive offers 10 to 25 percent faster application performance than competing 5400 RPM drives. "Today's notebook PC users are sophisticated and expect high returns on investment. The Travelstar 5K250 with ultra-high capacity of a quarter-terabyte enables our notebook users to create or access multimedia files with speed, assuring enhanced efficiency," said Campbell Kan, Vice President of Mobile Computing Business Unit, Acer Inc. "Acer is partnering with top-tier suppliers that help Acer accomplish its goal of designing empowering technologies that improve people's lives at work or at leisure." The Hitachi Travelstar product line has maintained its position as the world's most popular 2.5" hard drive for more than 15 years2. The 5K250 uses perpendicular magnetic recording (PMR) technology, which builds upon the highly successful debut of the Travelstar 5K160 hard drives. Hitachi will also offer an enhanced-availability version, the E5K250, which is designed for applications needing around-the-clock access in lower transaction environments, such as blade servers, network routers, point-of-sale terminals and video surveillance systems. "The Travelstar 5K250 was built from the ground up for notebook PC users who demand high capacity, ruggedness, speed and power efficiency," said Shinjiro Iwata, chief marketing officer, Hitachi Global Storage Technologies. "With all of the improvements we've integrated into the 5K250, we are confident Hitachi will continue to maintain its leadership position in the 2.5" hard disk drive space." 400 G operating shock (1000 G nonoperating shock) gives your data the best protection against bumps and rough handling. Bulk Data Encryption3 from Hitachi is a hard-drive level data security mechanism that essentially puts users' data under lock and key for virtually impenetrable protection. It is offered as an option on the Travelstar 5K250 hard drive as well as the recently announced, Travelstar 7K200 hard drive, which is the 7200 RPM, high performance model of the product line. Previously, data on a hard drive could be protected either through software-based encryption or a system-level password. However, hard-drive level encryption provides a higher level of benefit than both these options by offering better performance than software-based encryption and a higher level of security than system password protection. In Bulk Data Encryption, data is scrambled using a key as it is being written to the disk and then descrambled with the key as it is retrieved. Thus, data encryption at the hard-drive level is generally considered a more sophisticated approach to securing users' data. Another benefit to hard-drive level security is the data-erasing process. Today, hard drives must either be physically destroyed or the existing data must be written over and over before it can be safely discarded without fear of data piracy or identity theft. Bulk Data Encryption makes data-erasing unnecessary. By simply deleting the encryption key, the data on the hard drive is rendered unreadable and, thus, safe from prying eyes. With the rise in notebook theft and the relative ease in which software-based password security can be compromised, Hitachi's Bulk Data Encryption is an essential component for on-the-go notebook users. Hitachi Global Storage Technologies trademarks are authorized for use in countries and jurisdictions in which Hitachi Global Storage Technologies has the right to use, market, and advertise the brands. The Travelstar trademark is authorized for use in the Americas, EMEA, and the following Asia-Pacific countries and jurisdictions: Australia, Hong Kong, Japan, New Zealand, Singapore, South Korea, and Taiwan. Please contact Hitachi Global Storage Technologies for further information. Other company, product and service names may be trademarks or service marks of others. PR: Fujitsu Limited has announced that it has updated its lineup of hard disk drives (HDDs) for enterprise applications1. The new product line includes 2.5'' drives running at 15,000 rpm which support the mainstream Serial Attached SCSI (SAS)2 interface and Serial ATA3 interface, providing a one-stop solution to meet an increasingly diverse array of market needs. Enterprise customers are looking for HDDs that deliver better I/O performance4, lower heat levels, lower power consumption, more sophisticated processing performance, and higher reliability. With its new line of 2.5'' drives running at 15,000 rpm and 2.5'' drives supporting the SATA interface, Fujitsu can meet all of these needs. Supporting SAS and other traditional interfaces, the new lineup includes the MBB2 series of 2.5'' drives running at 10,000 rpm, as well as Fujitsu's first 2.5'' drives running at 15,000 rpm, the MBC2 series, and the MBA3 series of 3.5'' drives running at 15,000 rpm. Each of these series boasts best-in-class specifications and are ideal for server and storage implementations. Fujitsu is also introducing the MHW2 BK series of 7,200 rpm 2.5'' drives that are SATA compatible and designed for 24-hour continuous operation. Available in capacities up to 120 GB5, they are Fujitsu's first SATA-compatible HDDs that also include built-in functions designed to minimize the adverse effects of Rotational Vibration6. For enterprise applications: For use in high-reliability, high-performance server and storage systems for mission-critical business applications. Serial Attached SCSI (SAS): A new serial interface for SCSI capable in the future of higher data-transfer speeds than the parallel interface. Systems configured with SAS drives can also incorporate SATA drives. Serial ATA (SATA): The Serial Advanced Technology Attachment (SATA) interface is one of the ATA standards for connecting a computer to a hard disk drive or other storage device. Each device has a 1:1 signal path to the host, transmitting data serially (one bit at a time). Therefore, high-speed data transfer without interference or noise is possible. This interface is also capable of handling even faster data transfers. 120 GB: 1 gigabyte is equivalent to 1,000,000,000 bytes. Usable storage capacity is actually less than this figure. Actual storage capacity may vary depending on the environment and formatting of the customer's system. Rotational Vibration: Rotational Vibration can occur when multiple drive mechanisms are mounted in a single chassis. RoHS directive: Restriction of the use of certain Hazardous Substances in electrical and electronic equipment: A directive issued by the European Union on February 13, 2003 that has set legal regulations for hazardous substances in electrical and electronic equipment to minimize risk to the environment and people in member countries. Based on the directive, as of July 1, 2006, the amount of lead, hexavalent chromium, mercury, cadmium, polybrominated biphenyls (PBB) and polybrominated diphenyl ether (PBDE) is regulated in electrical and electronic equipment intended for Europe. 1 gigabyte is equivalent to 1,000,000,000 bytes. Usable storage capacity is actually less than this figure. Actual storage capacity may vary depending on the environment and formatting of the customer's system. This device supports the Serial ATA 3.0 Gb/s standard, and can also be used in environments with the Serial ATA 1.5 Gb/s interface. PR: Reaching for the "sweet spot" of memory storage for laptop computers, SanDisk Corporation has expanded its line of solid state drive (SSD) products with the introduction of a 64-gigabyte (GB)1 SSD aimed at both enterprise users and early adopter consumers such as gamers. 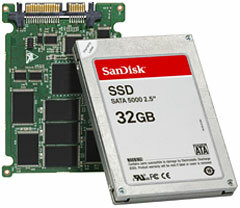 SanDisk 1.8" UATA 5000 and 2.5" SATA 5000 SSD products, which already are available in a 32 GB capacity, are compatible as drop-in replacements for hard disk drives in most mainstream notebook computers. The announcement was made at Computex Taipei 2007, where SanDisk is showcasing its comprehensive line of storage products for use in industrial and system-level embedded applications. SanDisk's new 64 GB SSD will be on display in Hall 1 in Booths C1000, 1002 and C1004 along with other SanDisk OEM embedded flash storage products such as iNAND™ and mDOC H3. SanDisk SSDs deliver 2 million hours mean time between failures (MTBF)2, approximately six times more than notebook hard disks. With no moving parts, SanDisk SSDs are also much less likely to fail when a notebook computer is dropped or exposed to extreme temperatures. With no moving parts, the flash-based SSD starts working almost immediately to achieve far better access speeds than a conventional hard disk drive. For example, in notebook computers, data moves to and from an SSD more than 100 times faster than data moving to and from a hard disk. SanDisk SSDs offer a sustained read rate of 67 megabytes (MB) per second3 and a random read rate of 7,000 inputs/outputs per second (IOPS) for a 512-byte transfer4. As a result, notebooks equipped with a 2.5" SanDisk SSD can boot Microsoft Windows Vista Enterprise in as little as 30 seconds5 and access files at an average speed of 0.11 milliseconds6. A notebook using a hard disk requires an average 48 seconds to boot and an average 17 milliseconds to access files. Compared to a typical hard disk drive, which consumes 1.9 watts7 during active operation, SanDisk SSDs consume 1.0 watt (0.5 watts for 1.8") while active and as little as 0.4 watts (0.2 watts for 1.8") while idle. This difference in power efficiency is particularly important in extending battery life for road warriors, enabling them to remain productive while in transit. SanDisk SSD products are available now to manufacturers. The company plans to offer 64 GB engineering samples in the third quarter, with mass production planned to commence prior to the end of the year. 1 megabyte (MB) = 1 million bytes; 1 gigabyte (GB) = 1 billion bytes. According to "Dataquest Insight: Expect PCs to Impact the NAND Flash Market after 2008," 15 December 2006, page 21-22. PR: SanDisk Corporation has introduced Cruzer Professional and Cruzer Enterprise, two USB flash drives that deliver strong security and state-of-the-art speed to business users. Cruzer Professional is primarily for individuals and small businesses who want to protect crucial data while also making it easy to share selected files. Cruzer Enterprise is primarily for medium and large organizations that require mandatory policy enforcement, central management and regulatory compliance. "USB flash drives offer an inexpensive and convenient way to carry large amounts of digital information in a pocket or purse, yet without proper security these benefits become a huge threat to businesses of all sizes," said Yariv Fishman, product manager for enterprise solutions in the USB business unit at SanDisk. "Cruzer Professional and Cruzer Enterprise are business tools, from a trusted leader in USB flash drives, which help ensure confidential data remains confidential - even if the drives themselves are lost or stolen." Cruzer Professional and Cruzer Enterprise offer password protection and virtually ironclad data security through hardware-based 256-bit AES encryption. Hardware-based encryption is much more reliable than the software-based security used in most consumer USB flash drives with password protection, because software-based protection relies on the host computer - which can be compromised by spyware and other threats -- to perform security operations. Cruzer Professional and Cruzer Enterprise are true plug-and-play devices, requiring no software installation on a host computer, so the drives will connect instantly to any computer running a modern version of Microsoft Windows. Cruzer Professional and Cruzer Enterprise are also very fast, with read speeds of 24 megabytes (MB) per second and write speeds of 20 MB/sec1. This reduces waiting time, which is particularly noticeable when moving large files such as business presentations and video productions. Cruzer Professional lets the owner establish a secure, password-protected "Privacy Zone" that can occupy anywhere from one percent to 100 percent of the drive's total capacity. The area outside the Privacy Zone is unprotected and is therefore open to any user. Here's how this can work: A sales executive heading out for a trip puts confidential business plans in the Privacy Zone of a Cruzer Professional, and a product presentation in the public area. Arriving at a client's office, the executive hands the Cruzer Professional to the client and allows the client to transfer the presentation - without worrying the client might accidentally or deliberately copy confidential files. Cruzer Enterprise features mandatory password protection for the entire drive, so all files are encrypted if the drive is lost or stolen. Mandatory encryption, as well as a set-up process that requires users to create complex passwords, make Cruzer Enterprise the USB flash drive of choice for organizations with high security requirements, such as public companies subject to the accounting laws, or healthcare providers falling under privacy regulations. Because Cruzer Enterprise doesn't require installation of drivers or establishing administrative right on any host computer, deployment is as simple as putting the drive into the hands of the user. Cruzer Enterprise is also compatible with many leading enterprise security solutions that enforce policies on usage of removable storage devices. For larger organizations seeking more functionality, as well as more efficient management of secure USB flash drives, SanDisk is introducing Cruzer Enterprise CMC (Central Management & Control) server software. Cruzer Enterprise CMC supports password recovery and renewal through the network, remote termination of lost drives, central back-up and restore, as well as central usage tracking and auditing. CMC is available now, with pricing information provided on request to enterprise clients. Cruzer Professional and Cruzer Enterprise are both available now in the United States. They are expected to be available in Europe in July, and in Asia later this year. Cruzer Professional and Cruzer Enterprise are compatible with Windows 2000, Windows XP, Windows Vista and Windows Server 2003. Cruzer Professional comes in three capacities, with manufacturer's suggested retail prices (MSRPs) as follows: 1 gigabyte2 (GB) for $54.99, 2 GB for $94.99 and 4 GB for $144.99. Cruzer Enterprise comes in the same three capacities, with MSRPs as follows: 1 GB for $74.99, 2 GB for $124.99 and 4 GB for $184.99. PR: Targus Inc., maker of the world's top-selling notebook computer cases and accessories, today announced five new Corporate Traveler Notebook Cases, which are designed with the frequent business traveler in mind. The new top-loading cases feature Targus' patented SafePort Air Cushion System for maximum notebook protection. The cases are lightweight and offer plenty of storage options for accessories, chargers or hard copy files. All of the cases are black in color and made of highly durable ballistic nylon, which prevents scratches and abrasions. The new Corporate Traveler cases also include Targus' exclusively patented Equalizer II shoulder strap, which is made of a flexible, clinging material for better weight distribution and a non-slip technology so it doesn't slide off your shoulder. The freestanding carrying cases are designed to fit notebooks with screen sizes up to 15.4" and are featured in multiple styles providing customers with many options. "We understand the unique needs of the frequent business traveler and design products that directly address those needs," said Michael Greco, director, product marketing, Targus. "These new cases offer top of the line protection, comfort, ergonomics, durability and functionality making them the ideal companion for the busy professional." "Business travel tends to be hectic, especially when going through airport security. Business travelers need notebook cases that offer a high level of convenience, protection and durability," stated John Samborski, president of Ace Computers. "Targus has always been an innovator when it comes to developing products that fit its customers' various needs. The new Corporate Traveler Notebook cases are robust yet lightweight and provide everything the business traveler requires, which ultimately keeps Targus at the forefront of the corporate notebook carrying case game." The Corporate Traveler features a removable sleeve for additional protection and adjustable cushions inside of the case to protect the computer from drop damage while providing a snug fit for smaller size notebook computers. For added convenience, the carrying case includes a zip-down workstation with business card holder, three pen loops, multiple accessory compartments, five scratch resistant CD/DVD sleeves and a zippered mesh pocket for easy retrieval of items. It is designed with leather wrapped nylon handles so it can be hand-carried, and also has a padded shoulder strap with non-slip coating so it can be worn over the shoulder. The Corporate Traveler measures 17" X 14.5" X 7", is 3.88 pounds and has an estimated street price of $89.99. The Corporate Traveler Vertical Roller is lightweight and includes a zip-down workstation with business card holder, three pen loops, key clip, multiple accessory compartments, five scratch resistant CD/DVD sleeves and a zippered mesh pocket for additional storage. The carrying case also has a separate file section to help keep documents organized and protected while in transit. Travelers will appreciate the two removable accessory pouches that provide additional storage for power cords, adapters and other accessories. Unique to this model, its longer, curved 41" dual trolley handle is designed for equal weight distribution to help prevent strain and easy transport. It also provides foot clearance for taller users. The case measures 18" x 14.5" x 8", weighs 6.44 pounds and has an estimated street price of $129.99. Weighing in at a slight three pounds, the 15.4" Ultra-Lite Corporate Traveler comes with an enhanced zip-down workstation with business card holder, three pen loops, key clip, multiple accessory compartments and a dedicated file section to help organize documents while on the go. It is constructed of durable ballistic nylon and includes leather wrapped nylon handles and a padded ergonomic shoulder strap with non-slip coding for dual carrying options. The product measures 17.25" x 14" x 5.75" and has an estimated street price of $79.99. The Leather Corporate Traveler is uniquely designed to fit 14" widescreen notebooks and notebooks with extended batteries. The case is constructed of quality leather and provides adjustable cushions inside of the case to protect the computer from drop damage while providing a snug fit for smaller sized notebooks. It includes a completely redesigned zip-down workstation similar to the Corporate Traveler, and can be carried by hand via the leather wrapped nylon handles or over the shoulder using the padded ergonomic strap. The case measures 16.5" x 13.5" x 5.75", weighs 3.19 pounds and has an estimated street price of $99.99. Weighing less than three pounds, the 14" Ultra-Lite Corporate Traveler is extremely lightweight yet durable enough to withstand the wear and tear of everyday travel. It has the same user-friendly features as its 15.4" counterpart and is constructed of durable ballistic nylon. Like the 15.4" version, it can also be carried by hand via the leather wrapped nylon handles or over the shoulder using the padded ergonomic strap. The case measures 16.5" x 13.5" x 5.75" and has an estimated street price of $79.99. All of the Targus Corporate Traveler products are offered with a limited lifetime warranty. PR: WiFind shows you if wireless networks are locked or unlocked and their signal strength - right in the AirPort menu. It's a tiny lightweight plugin for OS X that makes connecting to reliable wireless networks quicker and easier. Whether you're at home, the office or at your favorite cafe - WiFind will help you locate a signal and start browsing. PR: The JiWire WiFi Hotspot Finder dashboard widget for Mac OS X Tiger helps you get lightning-fast access to JiWire's complete global hotspot database, plus includes a built-in WiFi network detector to help you locate and connect to immediately available networks. With their comprehensive directory of more than 140,000 WiFi hotspots in 131 countries, JiWire makes it easy to find free and paid locations anywhere in the world where you can connect with your AirPort-equipped PowerBook, MacBook or MacBook Pro. JiWire's Hotspot Finder opens in network-detector mode showing available networks as blue links, and the network you're connected to in black. To select a network, just click on it. To access JiWire's full hotspot directory, click on the WiFi Hotspot Directory button. The more specific your search criteria, the more exact your search results will be. You can even search on a partial zip or postal code, such as 941 for San Francisco or SE1 for London. JiWire helps you locate free and paid WiFi hotspot networks, secure your wireless Internet connections, and learn how to use WiFi products and wireless broadband services. PR: With Devicescape, Mac laptop users can now automatically connect to any WiFi hotspots and municipal networks without having to click through log in screens or re-enter user names and passwords. "We're continuing to deliver on our promise to provide effortless WiFi connections from any device," said Dave Fraser, CEO of Devicescape. "Our Devicescape service is the perfect complement to Apple's philosophy of simplicity, ease of use, and always putting the needs of the consumer first. Now with Devicescape on your Mac laptop, getting connected at hotspots and on municipal networks is simply automatic. It can't get any easier than that." The Devicescape software for Mac OS X is available as a download from the Devicescape website. The software and the service are currently free. Once the software is installed, the user simply sets up an account and enters their user names and passwords for any network subscriptions they own. Users can also opt to accept access to free networks. In addition, if a users' favorite network isn't among the hundreds of thousands of hotspots that Devicescape already works with, users can request new networks with a simple web-based form. Once set up - connecting to hotspots and WiFi networks is automatic and requires no user interaction. Currently, Devicescape supports more than 60 public networks including the world's largest commercial carriers such as T-Mobile and British Telecomm Openzone, as well as free and municipal networks such as Google Mountain View, and university networks such as the AirBears Network at UC Berkeley. In addition to Mac OS X, Devicescape's service supports PCs with Microsoft Vista and Windows XP, Windows Mobile 5 Smartphones, the Nokia 770 and N800 Web tablets and the Linksys WIP 300 VoIP phone - with many more planned. Headquartered in San Bruno, Calif., the company is privately held and venture-backed by Kleiner Perkins Caufield & Byers, Enterprise Partners Venture Capital, JAFCO Ventures, August Capital and Applied Materials. The G4FanControl utility is run out of Mac OS X's Terminal program and users need to be logged in as root. Default temperature limits will be restored by Mac OS X in the event of a reboot. MiniBatteryLogger is a Cocoa application designed to monitor your laptop battery and log all the relevant power events. Sessions are now deleted in place instead of after unloading to prevent accidental loss of sessions. Added Battery Recall Assistant to track recalled batteries. Fixed garbled split view resizing in Statistics view. Battery Status view now correctly changes after the monitored battery is changed. Fixed occasional crashes when attempting to load corrupted saved sessions from disk. PR: Beginning immediately, Apple Macintosh users can remotely access their computers using any other computer, including a Windows PC, for free. The preview release of LogMeIn Free for Mac <https://secure.logmein.com/products/mac/> is the first remote access service that allows people to remotely access and control their Apple Macintosh computers from any Internet-connected device, including Windows, Macs, Linux PCs as well as many handheld devices. For example: A user can sit at a PC in New York and access a Mac in San Francisco - including all software applications on the remote Mac. Customers can also connect from a Mac to a PC and, of course, from a Mac to a Mac. "LogMeIn certainly follows the Mac-mantra of being simple to use and we are thrilled that Mac owners will now have the same ability to access their digital lives as our PC users," said Michael Simon, CEO, LogMeIn, Inc. "This further extends our position as the leading provider of remote access products and builds on LogMeIn's commitment to providing a platform on which businesses and individuals can connect, work with and support all their digital assets." "As the mobile workforce increases, so does the need for them to be able to access their work PC as well as personal PC from wherever they may be," says Stacy Sudan, Research Analyst in IDC's Mobile Enterprise Software program. "LogMeIn's support of Macintosh is significant because it allows mobile workers (and consumers) to be able to access all of their systems from anywhere." With millions of users worldwide, LogMeIn's simple and secure remote connectivity services have become the most widely used means to connect to remote devices. LogMeIn's patent pending technology ensures fast, SSL-secured connections through the company's datacenters - no need for users to manually configure ports on routers and firewalls. To achieve maximum performance, connections are shifted to a secure peer-to-peer link as soon as possible. LogMeIn Free is a free service that provides fast, secure, and easy access to a remote computer from virtually any web-enabled PC or Pocket PC with a high-speed Internet connection. Users obtain on-demand access to their work and home computers - viewing desktops, files and network resources - regardless of where they are. Many users world wide use LogMeIn Free as both a professional and personal remote computer support tool. The fully functional preview of LogMeIn Free for the Mac is available now at https://secure.logmein.com/products/mac/. Because LogMeIn continually updates its services, end users will be assured of always having the most up-to-date version available automatically. LogMeIn will introduce additional products for the Mac in the coming months. LogMeIn Free for the Mac is not a trial version of a paid product - it is available free of charge.